how does one feel when a gift is offered? i am cheered and thrilled. i accept gifts with complete delight and exuberance. i retain a gift to be exactly a ‘gift’. the manner of giving, and the gift, tells much about the giver…a gift is so much more than just a gift. there was a huge box waiting at my doorstep returning from new york. as i was not expecting a parcel of that size, my curiosity peaked. the shipper was Trend On Line. inside, there was a note from my bff janine. 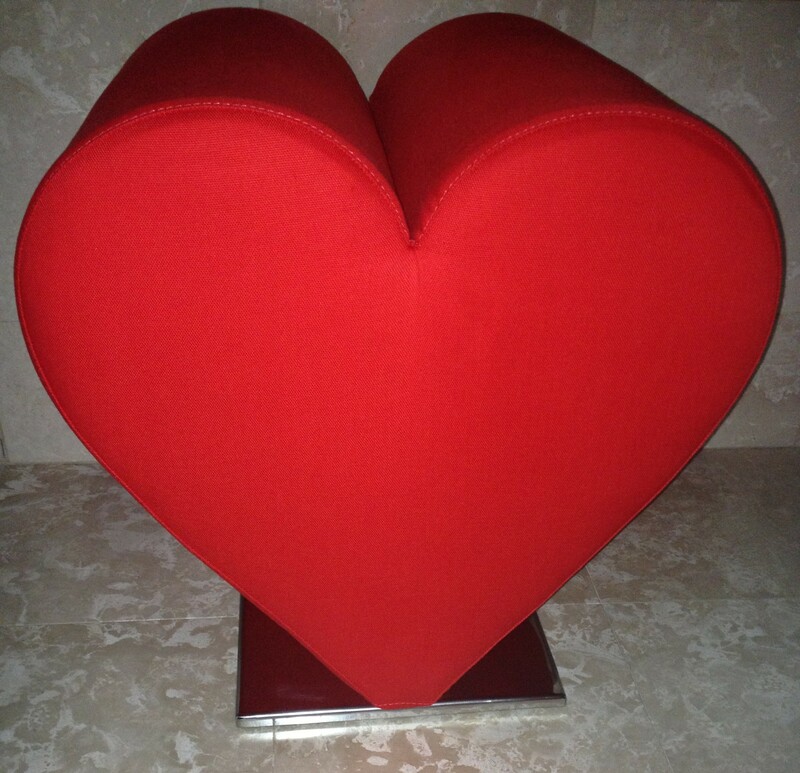 and a red ‘heart’ pouf. how fortunate could i be to receive this gift. a thrill. this object carries much significance, but the giver reveals so much more. i feel the giver. the gesture though, is infinitely the lasting thrill. such blessings. thankful i am to receive a gift. feeling thankful is for thebestdressup now! Trend On Line is a luvFAB internet site that offers a wide range of interior products to suit the most particular lifestyle. with worldwide shipping, acquiring the utimate design objects is just a matter of the many choices offered. i am enjoying my luvMUST pouf and treasure the spirit of the giver. this spirit is a gift. a priceless gift. this is ‘a gift’ for thebestdressup now! This entry was posted in ACCESSORIES, DECOR, luvFAB, luvMUST and tagged GIFT, INTERIOR INTERNET SITE, POUF, ROBERT FULGHUM, SENECA, THANKFUL, TREND ON LINE. Bookmark the permalink. Totally agree with you , about the meaning of the word ” gift “…. As for your magnificent heart…. It has more than one meaning! ciao! i am thankful and your compliment thrills me. you are most kind. ciao! your comment goes to my heart. thanks. Gift should be a gift from the heart… there is no value to be measured, though a lot of people get it wrong and use gifts to bind others in wrong ways …. It is a beautiful post!!! ciao! thank you for your personal comment. I so enjoy how your posts make me stop and think abou the “everyday”….and smile! ciao! thanks…you made me smile. i love your blog and always look forward for your new post…you are very inspiring and every word you write you can feel its from the heart , so how could i see this heart and not give it to..
you are a sister to me and thought we are far away you are in my heart always. ciao! thank you. i am most fortunate to have you in my life and your love indeed grows my heart. the distance between us is just space that my heart does not understand and as a result you are not ever far.